Photos from the conference are now online at Flickr. After you browse and reflect, please respond to our brief survey to help us plan for an even better Schools of Thoughts in the future. Your feedback is very important to us! Phew! It’s over and I’m overwhelmed by all the weighty words and thoughtful reflections. For me it was like trying to attend a 3-ring-circus while simultaneously keeping the lions and elephants in command. Now I’m trying to wrestle into some sense my observations – what resonated and what to grapple with. Hopefully others will contribute to this effort and together we can cull a valuable collective consciousness that results in much needed and required rethinking of our pedagogical models. Without the exceptional generosity of many individual and companies, Schools of Thoughts 3 would not be possible. We applaud and would like to thank all of the following folks for their labor and support. The conference is held at Art Center's main campus. The address is 1700 Lida Street, Pasadena, California 91103. The telephone number is (626) 396.2200. On Saturday, registration will be outside of the cafeteria from 8:15-8:45am, then moves to outside of the Ahmanson Auditorium from 8:50-11:00am. Park in any of the 3 Art Center lots (indicated as Faculty/Staff, Guest, or Student) and enter the building as indicated on campus map linked below. Wireless access is available during the conference on the "ACCDPUBNET" network throughout the building. SOT3 will have a variety of books for sale. Recommendations for the selections were made from our conference presenters and organizers. The bookstore is located in the Student Store across from the cafeteria. It may also be available outside of the Ahmanson Auditorium on Friday evening and Saturday mid-morning. The bookstore is closed on Sunday. Note that conference sessions are in locations in a variety of areas on campus. Some locations are at opposite ends of the campus. It takes 5 minutes to walk from one end of the campus to the other. Please be aware of this as you plan your schedule for workshops and breakout sessions. for Schools of Thoughts 3. SOT3 Mapping Project: Where is the discipline heading and in what contexts are graphic designers working? We organize information on maps in order to see our knowledge in a new way. As a result, maps suggest explanations; and while explanations reassure us, they also inspire us to ask more questions, consider other possibilities. For the duration of Schools of Thoughts 3 all conference attendees are invited to collaborate in creating a map of graphic design today. This map will attempt to locate graphic design at this very moment while considering what constitutes or delineates the current field and practice and in what direction it might be heading (or not). In Art Center cafeteria will be a magnetized chalkboard where you can write, draw, deviate, derive, dérive, pinpoint, and post. This collective activity will drive this work-in-progress (to wherever it ends). As we progress, we will be recording the procession of the map with periodic photographic documentation in order to preserve this—your most spontaneous form of scholarship. Up Next 2007 is a free event scheduled the day before the opening of the AIGA Schools of Thoughts conference at Art Center, and will address issues of concern to educators and practitioners alike. Hosted by the graduate Media Design Program (MDP) of Art Center College of Design on Thursday, March 8 from 2:00 to 7:00, with a reception to follow. We hope to see you there. to name the more obvious. changing the terrain that graphic designers navigate. seem increasingly difficult to discern. How is education meeting these challenges? or more likely careers, within them? or is a graphic design curriculum becoming a quaint notion? Schools of Thoughts Graphic Design Educators Conference. Discussions among and tales betwixt. Please note that the panel descriptions for Designing for Multiple Devices, moderated by David Womack, and History, Theory, Writing in Studio, moderated by Lorraine Wild, are updated and complete.  Also, the last of twelve breakout panel sessions seeks content. If you are thinking about a topic, and if you submit your proposal early and it is accepted, we may be able to post it here as part of the open call for papers. As I understand it, we’re here to map the terrain of contemporary graphic design—the terrain that today’s graduates must travel through and check it corresponds with the map that design education is actually using. Given the depth of Adobe's Creative Suite, how's a user to know all the gems hidden inside Photoshop, Illustrator, InDesign, or Acrobat? In this session, Scott will show how to get the most from these amazing products by uncovering some of their most important (and least understood) features. How do I get my students to participate in class discussions? How do I succeed with a large number of students? What are some tips for the first day of class? How do I handle difficult students? What can I do to get my students to excel? How do I help my students to "get it"? How do I facilitate a lively and productive crit? This workshop is a hands-on experience where you‚ ¨! "ll learn a variety of techniques and strategies to make your classroom experience more successful. The sessions include many practical tips you can use right away. So you know the CS apps pretty well and you're ready to push on to the next level. In this session, Scott will show you how to super-charge your workflow by while using Adobe Bridge, Photoshop Actions, Scripting, Acrobat Form Recognition, Adobe Connect, and an arm-load of advanced techniques throughout the entire Suite. Time permitting, Scott will also demonstrate how to create interactive PDFs with buttons, links, and embedded movies and sounds directly from InDesign. Not for the timid. A film on graphic design in the Los Angeles area created in 1986 stars Los Angeles designers Saul Bass, Douglas Boyd, Keith Bright, Jim Cross, John Cleveland, Louis Danziger, April Greiman, Ken Parkhurst, Jack Roberts, Bob Runyan, Don Weller (Weller Institute for the Cure of Design), and many more. These interviews share a conversation with these illustrious designers on their views, working environment, and work, as well as questions about their education, design style, idols or mentors, advice to students and teachers, and the evolution of graphic design in Los Angeles. This presentation is targeted to help design educators prepare students for buying print and working with printers to get the best results out of the process. The workshop will discuss everything from file preparation, to the most common mistakes (as well as ways to avoid them) to the latest in print technology. We’ll also cover stochastic screening, internet-based file submission and proofing and color management, as well as estimating. The importance of clear specifications that enable a successful partnership with your printer will top off the discussion. and author of Maps of the Imagination. in what contexts will graphic designers be working? How is Curriculum Anticipating Emerging Practices? What Good is a Terminal Degree? will graphic designers be working? Concluding address: Where is the discipline heading and in what contexts will graphic designers be working? Mapping Project: Where is the discipline heading and in what contexts are graphic designers working? During Schools of Thoughts 3 all conference attendees are invited to collaborate in creating a map of graphic design today. This map will attempt to locate graphic design at this very moment while considering what constitutes or delineates the current field and practice and in what direction it might be heading (or not). In Art Center cafeteria will be a magnetized chalkboard where you can write, draw, deviate, derive, dérive, pinpoint, and post. This collective activity will drive this work-in-progress (to wherever it ends). As we progress, we will be recording the procession of the map with periodic photographic documentation in order to preserve this—your most spontaneous form of scholarship. Field Trip Like its namesake, this FORUM is meant as serious fun, a diversion from the regular curriculum, but still an important learning experience. Moderated by Kenneth Fitzgerald, the forum is open to all. Topic and moderator to be determined. Systems help us make sense of choice and manage complexity. They offer scaffolding on which we can build. Think, for example, of tatami mats, the DIN paper system ("A" sizes), Adrian Frutiger's Univers family of typefaces. All are systems in which we can design. The idea that digital information should be accessible to "anyone, anywhere, anytime, anyhow" creates both challenges and opportunities for the graphic designer. As information becomes more fluid and its manifestations more mutable, it seems increasingly resistant to being graphically designed. The free flow of 1s and 0s through multiple devices burns away context, leaving only bare wires of data to be sliced up by search engines, spliced into RSS feeds, or absorbed by the ambient interactions of the technological surround. Traditional business models are failing in the face of global competition, and American companies are scouring design schools for design-innovators to lead them into the twenty-first century with creative strategies. Great. But the question is, where will these young designers lead us? Allan Chechinov poses more than a few tough questions in Something for Nothing? Design education is forever acknowledging that any design problem comes with a set of criteria and constraints. These two players are pitted against each other, balanced, traded off. The popular triad of time/quality/price (that you can ever only have two of the three) is a fun parlor trick, but it hardly takes into account what may be the more accurate either/or paradigm at play: In design, if you get something, you give something. Contribute your thoughts on the Schools of Thoughts 3 Blog. In addition to her role at Art Center, Anne Burdick is Design Editor of Electronic Book Review (electronicbookreview.com). In her practice, Anne collaborates with texts and writers to produce new modes of reading and writing. Despite winning the prestigious Leipzig Award for the “Most Beautiful Book in the World,” Anne does not call her practice book design. Rather, she designs spaces for writing in diverse media and environments, which sometimes includes books. Her projects are wide-ranging: poetry installations for the Getty Research Institute, unique approaches to lexicography with the Austrian Academy of Sciences, experimental fiction at the Walker Art Center’s Gallery 9, and books of literary/media criticism by authors such as Marshall McLuhan and N. Katherine Hayles. Lance Carlson has taught at the School of the Art Institute of Chicago, CalArts, Art Center College of Design, and other colleges, universities, and art & design programs; he holds graduate degrees in both cultural studies/sociology and design. His work as an artist is in select collections including the San Francisco Museum of Modern Art, the Houston Museum of Fine Arts, and the Smithsonian, among others. For the last fifteen years, he has published art criticism and cultural commentary, including attention to the rapid changes in design thinking. His interest is in the redefinition of design and creative process as fields of inquiry and practice, especially with regard to how art and design institutions can embrace and animate a definition of design having more to do with human systems (especially as applied to business, organizations, and communities) than aesthetically-rooted theory and practice. Allan Chochinov is a partner at Core77, a New York-based design network which supports the global design community through both online and offline initiatives. He serves as the editor-in-chief of Core77.com, one of the most widely read design websites in the world, and as strategist for Coroflot.com (design jobs and portfolios) and DesignDirectory.com (design firm database). Prior to Core77, his work in product design focused on the medical and diagnostic fields, as well as on consumer products and workplace systems. (Johnson & Johnson, Herman Miller, Federal Express, Kodak, A.C. Nielsen, Oral-B, Crunch Fitness and others.) He is associate professor at New York's Pratt Institute, where he teaches two courses in the Graduate Industrial Design Department. He has been named on numerous design and utility patents, and has received awards from I.D. Magazine, Communication Arts, The Art Directors Club and The One Club. He received a B.A. in Philosophy from the University of Toronto, and a Masters of Industrial Design from Pratt Institute. Meredith Davis is Professor and Director of Graduate Programs in the Department of Graphic Design at NC State University. She is also Director of the College of Design PhD in Design and teaches graduate courses in design and cognition. Meredith holds degrees in design and education from Cranbrook Academy of Art and Penn State University respectively. She taught for 13 years at Virginia Commonwealth University and has been at NC State for 16 years, where she served 10 years as department chair. Meredith currently teaches graduate courses in design and cognition and undergraduate courses in typography and design theory. Meredith was principal in the graphic design firm Communication Design from 1979-1989. She is the recipient of more than 50 national and international design awards and her work appeared in Graphis, ID Magazine, Print, Graphic Design USA, ACD 100, Creativity, Typography, and other publications. Meredith is a former president of the American Center for Design and the Graphic Design Education Association. She served on the national board of directors of the AIGA and as a frequent member of its various committees. She is currently the AIGA representative to the National Association of Schools of Art and Design and a member of its accreditation commission. In this position, Meredith has led the authoring of six briefing papers on graphic design education. Meredith consults with colleges and universities on curriculum development and assessment and has provided nearly 50 external reviews of faculty for tenure and promotion. Meredith’s research explores the use of design in achieving the goals of educational reform in K-12 schools. She has served as a member of the development team for the National Assessment of Educational Progress in the Arts and on the Goals 2000 Arts Education Partnership for the US Department of Education. She has taught for the Harvard Graduate School of Education and served as a consultant to the departments of education in Wisconsin and Michigan. Meredith authored the study of design in K-12 education for the National Endowment for the Arts, titled Design as a Catalyst for Learning; the book received the 1999 CHOICE award from the Association of College and Research Libraries. She has also served as consultant to the Smithsonian Office of Education and Museum Studies and reviews professional development proposals for the US Department of Education. Her work has been funded by the Kenan Institute for Engineering, Technology, and Science; Kenan Institute for the Arts; Kenan Institute for Private Enterprise; National Endowment for the Arts; and several state arts and humanities commissions. She is currently a member of a National Science Foundation sponsored team exploring the Science of Teaching Science in K-12 schools. Meredith is currently under contract to Thames and Hudson/UK for a series of college-level textbooks on graphic design, including an undergraduate introduction to design theory. She is a member of the editorial boards of Design Issues and Design Studies Review and reads manuscripts for MIT Press, Visible Language, and Design Studies Journal. Meredith authored the study of design in K-12 education for the National Endowment for the Arts, titled Design as a Catalyst for Learning; the book received the 1999 CHOICE award from the Association of College and Research Libraries. She is a frequent contributor to journals on design and design education and wrote the description of the discipline for high school students for the College Board. William Drenttel works in partnership with Jessica Helfand at Winterhouse, a studio focusing on publishing, new media and cultural institutions. Drenttel is a founding editor of Design Observer, the largest weblog of design and cultural criticism; a co-editor of Below the Fold:, a journal of visual culture published by Winterhouse; and the co-founder of the AIGA Winterhouse Awards for Design Writing & Criticism, a $5000 yearly prize. In 2006, Drenttel launched the Polling Place Photo Project, a national initiative to photograph the voting process in America. Drenttel is president emeritus of the American Institute of Graphic Arts, a fellow of the New York Institute of the Humanities at NYU and a trustee of the Cooper-Hewitt National Design Museum. He is a co-editor of four volumes of Looking Closer anthologies, the widely taught series of writings on graphic design. He is a former board member of Lingua Franca and Poetry Society of America, and has lectured at the Library of Congress, Walker Art Center, Annenberg Public Policy Center, Cranbrook Academy, and two national AIGA conferences, among many others. Drenttel received a B.A. in Film and European Cultural Studies from Princeton University. Dubberly Design Office is a San Francisco-based consultancy that focuses on making software easier to use through interaction design and information design. At Apple Computer in the late ‘80s and early ‘90s, Dubberly managed cross-functional design teams and later managed creative services for the entire company. While at Apple, he co-created a technology-forecast film called "Knowledge Navigator," that presaged the appearance of the Internet and interaction via a mobile device. At Netscape, he became vice president of design and managed groups responsible for the design, engineering, and production of Netscape's web portal. In 2000, he co-founded DDO. In addition to his practice, Dubberly also teaches. While at Apple, he served at Art Center College of Design in Pasadena as the first and founding chairman of the computer graphics department. He has also taught classes in the Graphic Design Department at California State University, San Jose, at the Institute of Design at IIT, and in the Computer Science Department at Stanford University. Kenneth teaches in the undergraduate Studio Art and graduate Visual Studies programs Old Dominion University, Norfolk, Virginia. His writings on design can be found in Emigre, Eye, Idea, and Redaction magazines; the books Graphic Design and Reading, The Education of a Graphic Designer volume 2, and the upcoming Looking Closer 5; plus the online journals Voice: AIGA Journal of Graphic Design, Design Observer, and Speak Up. He’s also contributed forewards for monographs by Robert Appleton, Elliott Earls, and Stefan Sagmeister. As producer, he created The News of the Whirled, a 4-issue limited-edition magazine that received awards from the American Center for Design and AIGA. As “collator,” he organized and toured "Adversary: an exhibition (of) contesting graphic design," from 2001-2004. After leading his own print design studio in Germany for six years, Jens Gehlhaar enrolled at the graphic design program at California Institute of the Arts, where he graduated with an MFA in 1997. His graduate thesis was The CIA Compendium, an encyclopedic typeface system. For the next three years, he worked as a freelance art director, graphic and type designer for Wieden+Kennedy, ReVerb, Imaginary Forces, Razorfish, Mike Mills, David Carson, Dreamworks and ESPN. His most prominent projects included the design of the launch print campaign for Microsoft Windows 98, the 1998–2001 network graphics package for ESPN X Games, as well as exclusive typeface designs for the Steven Spielberg movie “Minority Report”, for David Carson’s “Metropolis” magazine design, and for the IBM e-business Centers. From 1998–2001, he taught upper level typography, type design and motion typography at California Institute of the Arts and Art Center College of Design. In 2001, he joined bicoastal Brand New School as Creative Director, where he has co-directed campaigns for Volkswagen, Apple, Toyota, Vodafone and Budweiser. He has been responsible for the network identities of VH1 Classic, Fox Fuel and IMF; as well as the typography of campaigns such as UPS, AT&T and American Express; and packaging for MTV Sunday Stew and MTV2 Sic’em Friday. He has also written and directed dozens of live action station identifiers for VH1 Classic, Fox Fuel and IMF, as well as a music video for the British band Muse. Among other awards, he has received a Sports Emmy for television graphics, an ADC Gold Medal for live action direction, a TDC award for type design and an MVPA award for Special Effects. Nik Hafermaas has been the department chair of Graphic Design at Art Center College of Design (www.artcenter.edu/gpk) since August 2004, where he has created a new Graphic Design curriculum and co-hosted studio abroad programs in Berlin, Copenhagen and, most recently, in Tokyo. His current large-scale environmental work PowerPLANTs – a major public work awarded by the City of Pasadena – made its debut before a professional audience at the Art Center Design Conference in March 2006 at the Wind Tunnel in Pasadena. Prior to Art Center, Mr. Hafermaas was a Professor of Integrated Design and Temporary Architecture at the University of Arts, Bremen and curator of the Berlin-based network Young Creative Industries. His clients included the Bertelsmann Media Group, World Expo 2000, Audi, Deutsche Telecom AG, Mercedes-Benz, Volkswagen and Zurich Financial Services, Expo.02. Mr. Hafermaas is also the former co-owner and chief creative officer of the design company Triad Berlin, where he and his two partners formed an integrated professional team of over 50 employees, shaping it into one of Germany’s leading design firms specialized in the field between industry and the arts, technological innovations, new media and contemporary culture. Most recently, he founded the design company UeBERSEE, specializing in narrative spaces. Mr. Hafermaas was recipient of the IF Design Award in 1999 and 2004, the German Design Club Award in 2000 and 2002 and the Art Directors Club Design Award in 2002. He studied Visual Communications and Architecture at the University of Arts, Berlin.